RC Blakes, Jr. is the devoted husband of Lisa Blakes and the biological father of three daughters, one son and two grandsons. RC serves as the Presiding Bishop of The Family of Churches Fellowship International (F.O.C.F.I), an organization that covers leaders and churches across America. 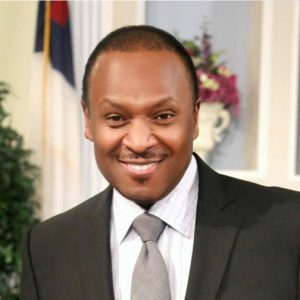 RC is the Senior Pastor of New Home Family Worship Center of New Orleans, Louisiana and Houston, Texas. RC has been in ministry since 1982. He has a Bachelors and Masters of Theology from Christian Bible College of Louisiana and is a nationally sought after teacher of the Word of God. His life application style resonates with all generations. His passion is to use his voice and influence to elevate, educate and reconcile humanity to God and each other. To this end, he has made appearances on the likes of: CNN, AlJazera and FOX to address various current issues at turbulent times. RC believes that we cannot separate social justice from the message of Jesus Christ. RC and the BLAKES Family also own and operate KKNO (750am), a Christian radio station in New Orleans, Louisiana. RC has authored several books. His most popular is The Father Daughter Talk. It’s the conversation every woman should have had with her father. The Father Daughter Talk has attracted global attention to his ministry and connected thousands of women to his fatherly voice. Some of his other literary works are Wisdom for Women In Ministry, The Laws of Manifesting Your Vision, God’s Playbook For A Winning Family (Co-authored by his wife Lisa), and Soul Ties-Breaking The Ties That Bind. RC also has a heart to raise up a righteous generation of men and has created The Manhood Academy. The Manhood Academy is a course which studies classical manhood and challenges men to return to the biblical model of manhood. His ministry is characterized as empowering, positive, practical and prophetic. He, his family, and ministry are known for their philanthropic outreaches. RC believes the greatest office that anyone can hold is that of a Servant.